Initially, the first generation M45 that came out in 2003 and 2004 was engineered for the narrow Japanese streets. When it was introduced in the American market, the cabin was said to be too small for Americans tastes. The backseat was insufficient in terms of legroom and even worse its design was not considered to be very attractive. Nevertheless, this car had very good safety features like other new models and had good value with its 18 inch wheel, high performance tires and a decent handling ability. The newer models produced between 2006 and 2010 came with remarkable changes in room and design that provided a top-notch construction worthy of consumer attention. Whereas earlier versions came with 4WD, strong brakes and tuned suspension, later version stepped up the level with 19 inch wheels, xenon lights, lane-departure warning and a surround sound system. The exceptional design is composed of a pronounced interior with heavy bolstered seats. 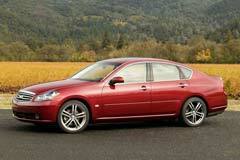 The Infiniti M45 is a has surely improved over the years and a used second generation M45 is worth considering.